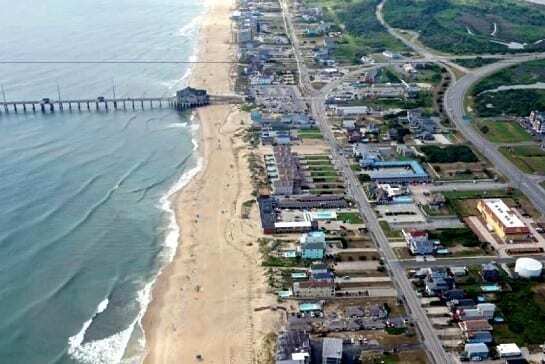 Nags Head’s shoreline is gaining sand in some areas, holding its own in others and losing ground to the surf in a few hot spots and at its far southern end, according to an analysis of the town’s 4-year-old beach nourishment project. Tim Kana, president of Coastal Science and Engineering, told the town’s Board of Commissioners in a presentation Sept. 16 that about 70 percent of the new sand is gone along the last quarter mile of South Nags Head. But farther north, toward the Nags Head Fishing Pier, the analysis shows a net gain. About 4.6 million cubic yards of sand were pumped onto the beach during the widening project along 10 miles of beach in the late summer of 2011 at a cost of around $34 million. The northern 5.5 miles from Bonnett Street to Governor Street has seen an increase of 11 percent in the system, which extends from the dune line to 19 feet of depth in the ocean. South of that, the 2.4 miles from Governor Street to James Street, lost 7 percent. James Street to Tern Street, a total of 2.6 miles, lost 45 percent. The last 1,500 feet from Tern Street to McCall Street, where a taper was created to the border of National Park Service land, has lost 70 percent. Overall, Kana said, the project has lost an average of 15 percent of the sand that had been added to the system. The prediction was an overall loss of 40 percent by now. Meanwhile, winds and tides have pushed about 1 million cubic yards into the dunes, which in some areas has created problems for private property owners. More sand fencing will be needed to address the problem, he said. Sand from the extreme southern end of the beach has migrated onto the Park Service Beach. “That’s happening because there’s nothing to hold the sand in place,” Kana said. A jetty or artificial reef would help, he said. The state has long had prohibitions against hardened structures on the shoreline, although some of those rules are starting to ease. “I would dare say that the project is not contributing significantly to shoaling in Oregon Inlet,” he said. “Remember, Oregon Inlet’s five miles away. He said Nags Head sand is replacing sand that has eroded from the seashore. Mobilizing a dredge to touch up eroded areas would not be worth the cost, which Kana put at $2 million to $3 million. Instead, he suggested bulldozing or trucking in more sand. Renourishment could wait until 2020 if current erosions rates continue, he said, but the town should start planning soon — first by seeking more permits — to start work by 2018.